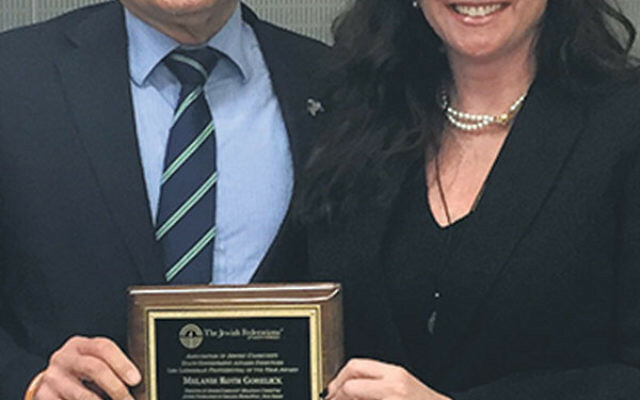 Melanie Roth Gorelick displays the 2016 Len Lieberman Professional of the Year Award she received from the Jewish Federations of North America. Melanie Roth Gorelick, the director of the Community Relations Committee of the Jewish Federation of Greater MetroWest NJ since 2009, is taking her skills as an activist on numerous issues across the Hudson River. On May 2, she will become vice president of the national Jewish Council for Public Affairs. The JCPA, which describes itself as “the public affairs arm of the organized Jewish community,” coordinates and advises 16 national and 125 local agencies comprising the field of Jewish community relations. Roth Gorelick, who began as associate director of what was then the MetroWest CRC in 2006, is also the founder of the New Jersey Coalition Against Human Trafficking, which is convened by the GMW CRC. Comprised of representatives of 120 religious, civic, and women’s organizations, the coalition was launched in 2011 to advance the aim of ending human trafficking through education, advocacy, and assistance to survivors. During her tenure at the CRC, Roth Gorelick has also been active in Israel advocacy, criminal justice reform, programs to end hunger in New Jersey, and efforts to stop the genocide in Darfur. Another focus has been women’s issues, including organizing the first NJ domestic violence public policy roundtable. Part of that “big tent” was a Step Up For Israel program that was used “to fight against the anti-Israel Boycott Divestment, and Sanctions movement prevalent on many college campuses,” she said. “We helped create a strong Israel program for college kids in our area who do not have Hillels on their campuses and for high school students to help them fight BDS and be ready to confront it when they get to college. Combining concerns for women’s issues and Jewish affairs, the CRC created a program called Jewish Women in the Political Sphere. A new emerging issue that she hopes will be a major CRC effort is criminal justice reform. Most recently, on April 6, the CRC sponsored a program, “Building One Community: Criminal Justice Reform and the Jewish Response,” which featured a panel of legal and legislative experts. 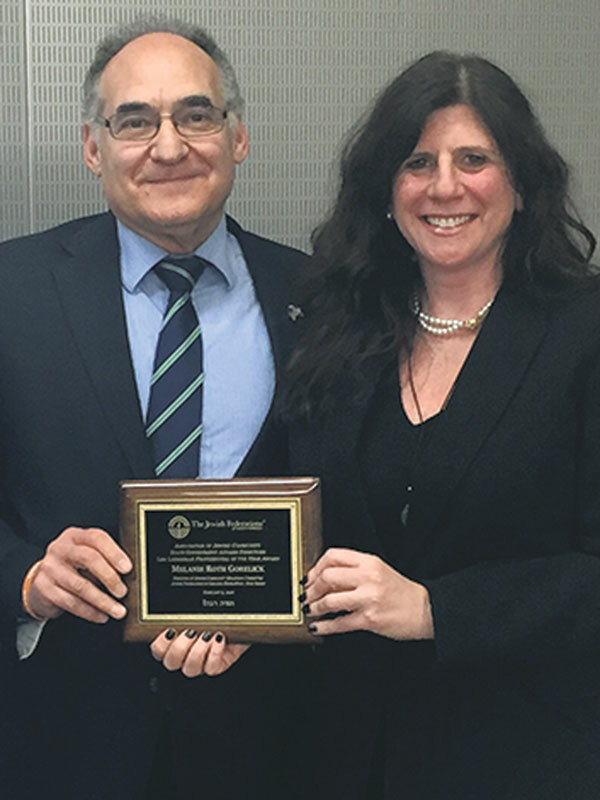 “The criminal justice reform movement is the civil rights movement of our time because the Jewish community does not live in a bubble,” she told NJJN. Roth Gorelick’s efforts as an advocate for the Jewish community and beyond have earned her the Essex County Stars Award in 2012 from Essex County Celebrates Jewish Heritage Month, the JCPA Program Excellence Award for the NJ Coalition Against Human Trafficking in 2014, and the Outstanding Human Rights Community Activist 2014 from the Human Rights Institute at Kean University. Dov Ben-Shimon, CEO and executive vice president of the Greater MetroWest federation, told NJJN, “We are proud of Melanie’s achievements and saddened by her departure. We are grateful that she is moving to our partner agency, the JCPA, and know she will continue to serve our community and Jewish communities across North America with the same high level of professionalism and dedication that she has shown here.